PALM BEACH, Fla. — President Donald Trump used a Thanksgiving Day call to troops deployed overseas to pat himself on the back and air grievances about the courts, trade and migrants heading to the U.S.-Mexico border. SAN FRANCISCO — A U.S. appeals court blocked President Donald Trump on Thursday from immediately ending an Obama-era program shielding young immigrants from deportation, saying the administration’s decision was based on a flawed legal theory. 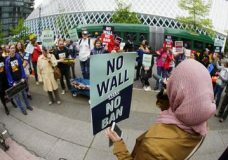 Arguments have wrapped up in a federal appeals court in Seattle over President Donald Trump’s travel ban.